Lit fic and manga and self-pubbed, oh my! So many books. These are the ones I made time for in 2014. Howard Norman’s so-real-I-could-taste-the-saltwater scenes of coastal Newfoundland in The Bird Artist. Fourth, books with southeast Asian settings: Five of the 22 (The Namesake, the Lowland, Crazy Rich Asians, Across the Mekong River, and The Art of Hearing Heartbeats) are set predominantly in southeast Asia. (Two more, The Reason I Jump and Into the Light, are set in Japan.) That wasn’t deliberate, but it makes me speculate how I might incorporate that influence someday. Fifth, nearly equal numbers of male and female authors. The works themselves are even at 11 each, but since Jhumpa Lahiri is represented twice, it works out to 11 men and ten women. I’ll strive for that balance again in 2015. Once I heard Jeffrey Eugenides (who mastered a hermaphrodite character) say that authors needed to be equally versatile at writing male and female characters. Reading authors of both genders is the best way to learn how. Finally, few self-pubbed…alas. Just three of the 22. Both Across the Mekong River and A Special Love are self-published, and Wool was originally.One of my 2015 reading resolutions is to seek out and discover more of these overlooked gems, like The Leaving of Things. It’s a debut novel by fellow Lake Union author Jay Antani, who first self-pubbed before getting picked up by the Amazon imprint, like me. 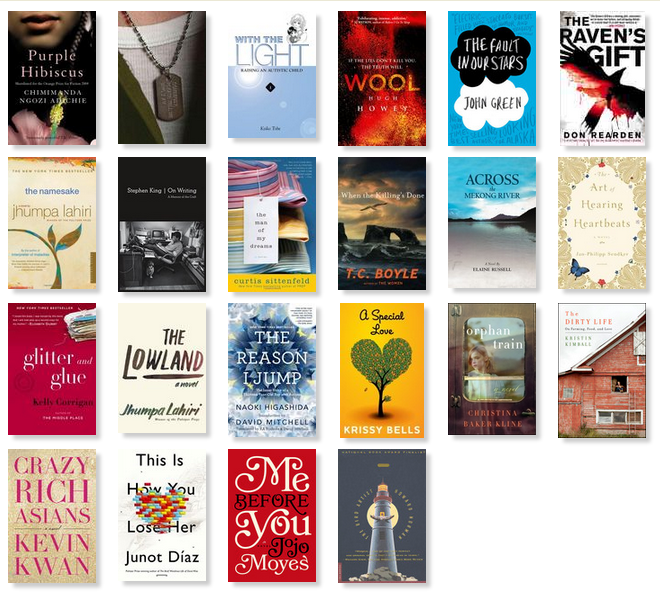 I’ll finish by the end of the week, and my 2015 list will be off and running. What was your favorite read of 2014? Any reading resolutions for the new year?